The 40′ Sealine Yacht Charter further captures your imagination with the large convertible cockpit roof, opening up or closing off the cockpit. The lower accommodation has maximized the use of the space creating simply a wonderful family boat. Your yacht rental adventure includes tours of Biscayne Bay and the surrounding Miami area. The S380 is an award winning boat, it’s a class leader and an innovator accommodating up to 13 passengers along with a Captain and Mate. The space is evident from the moment you walk onto the large swimming platform. The 40′ Sealine Yacht Charter further captures your imagination with the large convertible cockpit roof, opening up or closing off the cockpit. The lower accommodation has maximized the use of the space creating simply a wonderful family boat. 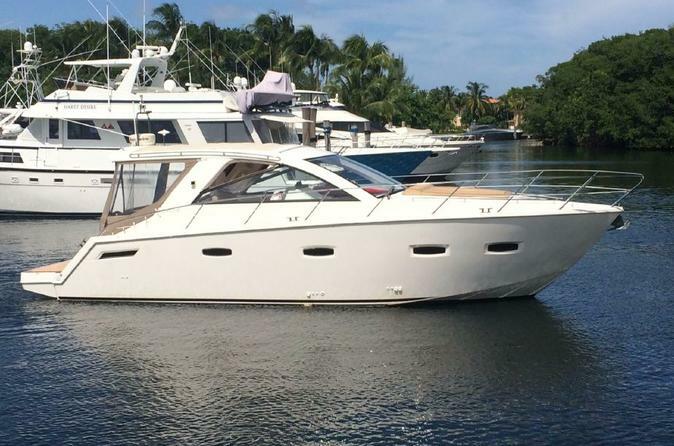 All yacht bookings over 40 feet are accommodated by a professional captain, stewardess, local fuel at idle speed and complimentary refreshments (sodas, water and ice). 8-hour charters include a bottle of champagne or liquor of your choice from our list of spirits.